Oncologist Dr. Eugenio Galindo looks back on cancer treatment center's grand opening celebration which took place earlier this year. 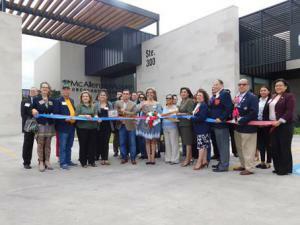 MISSION, TEXAS, USA, April 1, 2019 /EINPresswire.com/ -- Kicking off 2019 in style with McAllen Oncology's grand opening celebration in January, Dr. Eugenio Galindo, a veteran of the oncology field for more than three decades, reflects on the highly successful event, staged in association with the Texas city of McAllen's Chamber of Commerce. "We had over 375 patients and their families in attendance, as well as several representatives from the city's Chamber of Commerce," reveals Dr. Galindo of the grand opening celebration which took place in January. "It really was an amazing event," he adds. Oncologist Dr. Galindo continues, "At McAllen Oncology, we offer complete cancer care in a state-of-the-art facility which includes an innovative community infusion center with private suites and a diagnostic imaging center and laboratory." McAllen Oncology is the only cancer center of its kind in South Texas, says Dr. Galindo, explaining more about the clinic following its grand opening. "Our ribbon cutting was a great way to kick off 2019," he adds of the event which took place earlier this year, on January 11. The beginning of January marked a busy month for the South Texas city of McAllen. Other events which took place, in association with the McAllen Chamber of Commerce, included the Mediforce, LLC grand opening and ribbon cutting, the Rio Grande Regional Hospital ground-breaking, RGV Electrical Supply's grand opening and ribbon cutting, the Jalapenos Bar & Grill grand re-opening and ribbon cutting, and Ric Brown Family Funeral Home's 1st year anniversary and ribbon cutting, as well as grand opening and ribbon cutting events at Skinn Bar and ProSports Massage Clinic. With a membership of 2,000 and a staff of 21, the McAllen Chamber of Commerce was founded in 1924 as an evolution of the McAllen Businessmen's Club, which, 13 years earlier, and founded in 1911, drove the initial creation of the City of McAllen. "The McAllen Chamber of Commerce," adds Dr. Galindo, wrapping up, "is the largest chamber in a 15 county area, broadly regarded, I'm proud to say, as the most cutting edge, innovative, and progressive chamber in the region." Dr. Eugenio Galindo is certified in medical oncology through the American Board of Internal Medicine and has served in the Rio Grande Valley for more than 28 years. The medical director for McAllen Oncology, Dr. Galindo completed his fellowship at the University of Texas M.D. Anderson Cancer Center and is an active participant in bringing the very latest in cancer treatment and screening to the Rio Grande Valley area. Fluent in English and Spanish, Dr. Galindo has also authored several influential medical publications on the subject of oncology.